Khichdi is very popular cuisine of Gujarat and it is very light and healthy food. One of the healthy and light form of khichdi today we are going to learn. Suran khichdi is a rustic woody flavored khichdi recipe. It is very easy to prepare and it is made from shredded yam and delicate flavor filled with the spice make this dish very flavorful and delicious. 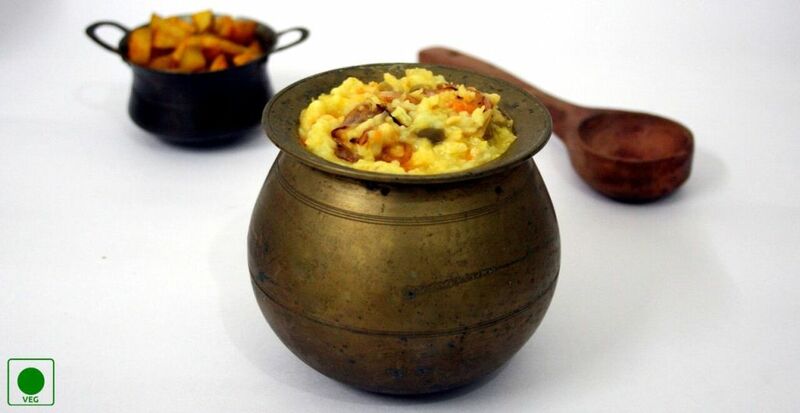 As a faral dish, this khichdi dish can be eaten on fasting days too. Try this recipe and relish the flavors of it. 1. Peel off the yam and grate it then immediately transfer it to the water before they get discolored. Drain them. 2. Heat a pan and dry roast peanuts till golden brown. Remove from the heat and allow it to cool. Once it cooled, remove skin and grind it to coarse powder. 3. In a thick-bottom pan, heat the oil and add cinnamon and cloves then saut? it for a minute. 4. Add ginger-chilli paste and saut? it for a while then add grated yam and rock salt. Mix well. 5. Lower the heat and cover the pan with plate then pour a little water to the plate and let the yam cook with the steam of water. It will take about 10-15 minutes. Stir twice or thrice in between. Sprinkle some water if needed. 6. When yam is well cooked add cinnamon-cloves powder, sesame seeds, ghee and sugar. Mix well. 7. Turn off the heat and add lime juice and chopped fresh coriander leaves. Mix it again. 8. Serve hot with farali paratha or it can be eaten alone as faral.